Posted on Thu, Feb 16, 2012 : 1:22 p.m.
Bake Me a Cake. 5:30-9:30 p.m. Zingerman's Bakehouse, 3711 Plaza Drive, Ann Arbor. Learn how to make (and take home) three complete cakes each requiring a different mixing technique -- Butter Cake, Angel Food and Flourless Chocolate Truffle Cake -- so the folks you're baking for can enjoy the fun, too. $125. 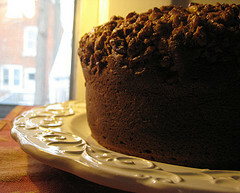 www.bakewithzing.com. Homemade Winter Pasta Workshop. 6 p.m. Ann Arbor Cooks, 5060 Jackson Road, Ann Arbor. Join us for a fun and warm evening of making handmade pasta and pairing it with interesting and satisfying sauces! Menu: Spaghetti with Creamed Leek & Spinach; Fettucine with Crab, Lemon, Chile & Mint; Tagliatelle with Chestnut & Wild Mushroom. $65. 734-645-1030. Southern Indian: Vegetable Stew & Appam with Jyothi Abraham. 6-8 p.m. Ann Arbor Whole Foods, 3135 Washtenaw Ave., Ann Arbor. Vegetable Stew served with Appam is a popular breakfast fare in Kerala. The simple, aromatic, hearty stew is slowly simmered in a subtly spiced coconut milk base. $39. Pre-registration is required at 734-994-2300, ext. 53203 or www.aareced.com. Tea Tasting. 6:30 p.m. Zingerman's Events on 4th, Kerrytown Markets and Shops, Ann Arbor. Green, black, ruby and golden: discover a palette of teas. We couldn’t think of a better way to round out a February evening than with our friends from Rishi tea. For more than 10 years, they’ve been sourcing teas direct from a variety of sources throughout Asia, and their steadfast commitment to quality has resulted in a fantastic selection. $35. 734-663-3400. Thursday Night Rush Hour Relief at the Wine Bar. 5-8:30 p.m. Cranbrook Whole Foods, 990 W. Eisenhower Parkway, Ann Arbor. An exploration of wine, cheese and appetizers. This week’s topic: Dry to sweet. 734-997-7500. Crawfish Boil. 5 p.m. Cranbrook Whole Foods, 990 W. Eisenhower Parkway, Ann Arbor. Craig will demonstrate a festive crawfish boil. $5. Stop by the customer service desk or call 734-997-7500. Fourth annual Artini Martini Crawl. 7 p.m. Ann Arbor's hippest downtown establishments will once again compete to create the most artful martini in the fourth annual Artini Martini Crawl. Participants will taste the carefully-crafted creations at each of the participating locations and will vote on their favorite. This year’s Artini Artists are Bab's Underground Lounge, The Black Pearl, Cafe Felix, La Dolce Vita, Melange, The Ravens Club, Rush Street and Vinology. A portion of the event’s proceeds benefit the nonprofit Ann Arbor Art Center. Attendees must be 21 or older. Guests dressed to impress in Mardi Gras attire will be rewarded with gifts and prizes. $45. www.annarborartcenter.org or ghan@annarborartcenter.org . spicy and hot. Meat is optional and will be offered with chicken at today’s class. $16. 734-741-7531. Beer tasting: Arcadia Brewing Co. 5-7 p.m. Cranbrook Whole Foods, 990 W. Eisenhower Parkway, Ann Arbor. Taste ales from Arcadia Brewing Co. in Battle Creek with knowledgeable staff. Pricing varies -- usually $6 for six tastes. 734-997-7500. Mini Mambo Italiano: Italian Breads. 5:30-9:30 p.m. Zingerman's Bakehouse, 3711 Plaza Drive, Ann Arbor. We’ll make ciabatta from Puglia, and focaccia from Genoa. $100. 734-761-7255. Wine Tastings in the Specialty Department. 3-7 p.m. Friday and 1-5 p.m. Saturday and Sunday. Ann Arbor Whole Foods, 3135 Washtenaw Ave. This weekend: Pantago Chardonnay, Pantago Malbec, Presto Moscato. Free, but must be 21 or older to sample. 734-975-4500. Health Starts Here 28 Day Challenge. 11a.m.-1 p.m. Ann Arbor Whole Foods, 3135 Washtenaw Ave. We will explore the four pillars of healthy eating through classes of nutritious knowledge and delicious food. The fee for the challenge includes cooking demos, samples, menu planning, short lectures and educational materials. $35 or $60 per couple. To register, stop by the customer service desk or call 734-975-4500. Teen Sushi. 1-3:30 p.m. Ann Arbor Cooks, 5060 Jackson Road, Ann Arbor. Come learn to make sushi rice, prep high quality authentic ingredients, and learn to roll maki sushi and inverted rolls. This class is for kids 13-17 years old. $55. 734-645-1030. Danish -- The Breakfast of Vikings. 1-5 p.m. Zingerman's Bakehouse, 3711 Plaza Drive, Ann Arbor. Make your own dough and create hand-shaped Danish. Almond, cream cheese or fruit filled - each surrounded by the rich tender flaky dough that is a good Danish. $125. 734-761-7255. Learn to Make Fresh Mozzarella. Noon-2:30 p.m. Zingerman's Creamery, 3723 Plaza Drive, Ann Arbor. Learn how to stretch your own from-scratch fresh mozzarella at home. First and third Saturday of each month, September through May. $60 (or $55 if paid in advance). Reservations required. 734-929-0500. Eat, Meet, & Be Cherry. 2-4 p.m. Cherry Republic, 223 S. Main St., Ann Arbor. "Eat, Meet, & Be Cherry" at the Cherry Republic, with a tasting from with Tio’s. Free. 734-585-5231. Wedding cake tasting. Noon-3 p.m. Glee Cake & Pastry, 117 S. Main St., Chelsea. Participants will be able to sample a variety of cakes, desserts and cupcakes accompanied by free, locally-roasted coffee. Brides and grooms may attend free, and additional guest tickets may be purchased for $5. Reservations are required for the February event and can be made by calling 734-475-3000 or stopping by in person. Space is limited to the first 45 guests. Chef Brian Polcyn of Birmingham's Forest Grille and Milford's Cinco Lagos. 3-5 p.m. Ann Arbor District Library, downtown branch, 343 S. Fifth Ave., Ann Arbor. Award-winning chef and charcuterie expert chef Brian Polcyn will prepare an incredibly delicious sample dish and discusses his life and his books. This event includes a book signing and books will be available for purchase. Do not miss this afternoon of culinary delight. Free. 734-327-4200. Coffee and Food Pairings. 1-3 p.m. Zingerman’s Coffee Co., 3723 Plaza Drive, Ann Arbor. Zingerman’s Coffee staff discuss and offer taste samples of foods that go best with some of their coffees. $30. 734-929-6060. Italian Winter Soups with Francesca Giarraffa. 6-8 p.m. Ann Arbor Whole Foods, 3135 Washtenaw Ave. Cabbage and Black Kale soup is simmered with smoked pancetta and borlotti beans in a tomato-based broth. Cauliflower, prosciutto, garlic and chillies are combined in a clear chicken broth to make a spicy soup. Try Uova in Purgatorio (eggs in purgatory), a tomato-based broth using fresh basil, onions, parsley and poached eggs. $45. Register with Ann Arbor Community Education and Recreation by calling 734-994-2300 ext. 53203 or at www.aareced.com. Junior Chef: 3-Day Mini Camp. 10 a.m.-1 p.m. Ann Arbor Cooks, 5060 Jackson Road, Ann Arbor. Let us do the shopping, teaching and clean-up over this winter break. Day 1: Breakfast: Omelets with Vegetables, Fruit Smoothies & HomemadeGranola. Day 2: Lunch: Lettuce Wraps with Pork & Ginger, Veggie-Fried Rice, Fortune Cookies. Day 3: Dinner: Grilled Marinated Chicken Kabobs, Orange-Fennel Salad with Vinaigrette, Cinnamon-Chocolate Brownies. For kids 9-12 years. $135 per person for three-day camp. 734-645-1030. Flat Breads! 5:30-9:30 p.m. Zingerman's Bakehouse, 3711 Plaza Drive, Ann Arbor. For this class we’ve developed four flat bread recipes for Pita, Matzo, Spanish Torta de Aceite, and Naan. You’ll learn everything you need to make these versatile, full-flavored breads. $100. 734-761-7255. Italian Mardi Gras. 6:30 p.m. Paesano’s Restaurant, 3411 Washtenaw Ave., Ann Arbor. Join us as we celebrate our annual Carnevale wine dinner on “Fat Tuesday." Enjoy a five-course festive Italian feast from Chef Davido with matching wines courtesy of special guest David Servello of David Vincent Selections. Come in costume if you wish, enjoy live entertainment. The restaurant will close its dining room for the event. $90. Reservations required. 734-971-0484. Celebrity Cooking Class at the JCC. 7 p.m. Jewish Community Center, 2935 Birch Hollow Drive, Ann Arbor. Sign up for our new monthly Celebrity Cooking Class. This month will feature Lori Shepard of Simply Scrumptious Catering. Chef Lori will be making comfort foods to warm us this winter. $25. Registrations required. 734-971-0990 or karenfreedland@jccfed.org . Fat Tuesday Bead Bash. 5 p.m.-2 a.m. Bar Louie, 401 East Liberty, Ann Arbor. DJ, beads, cake, drinks, $1 burgers all sounds like a great Tuesday and way to celebrate Fat Tuesday. Throw in $1,500 tuition giveaway, and we’ve got an amazing Tuesday. Bring your student ID. Free admission. 734-794-3000. Fat Tuesday 7-11 p.m. Corner Brewery, 720 Norris St., Ypsilanti. Bring your beads and party mask to help celebrate Fat Tuesday New Orleans style. Feast on a selection of traditional Cajun delicacies while enjoying a specially brewed Hurrican beer, which is a variation on the traditional southern festive drink. Dragon Wagon will be bringing their bluegrass-folk rock starting at 8 p.m. No cover. 734-480-2739. Big Top Revue 3: Ann Arbor Summer Festival Fundraiser. 7 p.m. Gratzi, 326 S. Main St., Ann Arbor. A three-course dinner with speakeasy-themed live entertainment, including vintage jazz, electro-swing and more, followed by coffee and late-night follies. 1920s attire encouraged, especially flappers, fedoras, pinstripes and pearls. 6 p.m. cocktail reception with hors d’oeuvres. $150 in advance. annarborsummerfestival.org or 734- 994-5999. Mardi Gras Celebration. 7 p.m. Zingerman’s Roadhouse. Chef Alex Young hosts a dinner featuring a menu with Roadhouse New Orleans favorites and new dishes he learned while on a recent visit there. $45 (beverages not included). Reservations required. 734-663-3663. Fondant Fondamentals. 5:30-9:30 p.m. Zingerman's Bakehouse, 3711 Plaza Drive, Ann Arbor. In this class we take you through the steps of making fondant and the techniques to shape it while we decorate a six-inch cake for you take home. $100. 734-761-7255. Fashion Inspired Cakes. 5:30-8:30 p.m. Sweet Heather Anne, 359 Metty Drive, Ann Arbor. This class focuses on fabric-like details, vintage buttons, hand painted patterns, and other fashion inspired techniques. Basic knowledge of covering cakes in fondant is recommended, but not required. You will leave with a fashion-inspired dummy cake of your own design, and a cake to enjoy at home. Class fees include all the materials you will need. $200. sweetheatheranne@gmail.com. Tea with the Fairies. Seatings at 1 p.m. and 4 p.m. Crazy Wisdom Tea Room, 114 S. Main St., Ann Arbor. Celebrate with our magical fairies as they serve tea, treats, and magic. Fairy attire is encouraged. $11 per person. Babies 18 months and younger free. Tickets are available at Crazy Wisdom or by phoning prior to the event. 734-665-9468. Savory Pies. 5:30 p.m. Zingerman's Bakehouse, 3711 Plaza Drive, Ann Arbor. Delve in to a few of the delicious savory pies found in just about every culture, like the empanada, so common in Spain, Portugal, Central and South America, and the knish, a Jewish staple in Eastern Europe. How about the pasty, served up by the thousands in Michigan's Upper Peninsula? $125. 734-761-7255. Chinese Hot-Pot-Chinese Style Fondue with Angela Yang. 6-8 p.m. Ann Arbor Whole Foods, 3135 Washtenaw Ave. The typical hot-pot meal contains clear broth, and can include meat, seafood, leafy vegetables, and cooked bean noodles with a dipping sauce (according to individual preference). Join Angela Yang as she guides students through the creation of this fun and satisfying meal that the whole family will enjoy.Tuition: $35. Mandatory Fee: $13. Register at www.wccnet.edu. Thursday Night Rush Hour Relief at the Wine Bar. 5-8:30 p.m. Cranbrook Whole Foods, 990 W. Eisenhower Parkway, Ann Arbor. An exploration of wine, cheese and appetizers. This week’s topic: Spanish reds. 734-997-7500.